When I heard about the book Smart Chefs Stay Slim by Allison Adato, I had a feeling I'd like it. 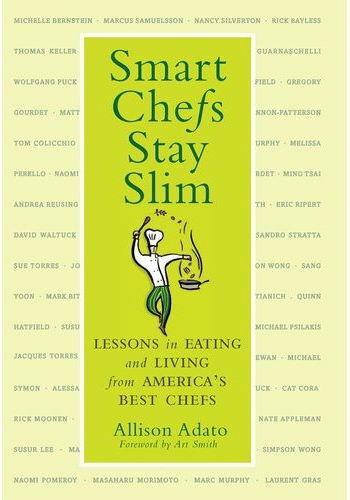 First, little snippets of wisdom from some of my favorite chefs. Second, recipes. I love cookbooks. Ask my sagging bookshelves. They'll agree. I have a cookbook problem. What I didn't realize was how much I'd love this book. You see, I tend to hate diet books. The last one I looked at had some ridiculously arbitrary rules, like on Tuesday you must eat a certain food. But only on Tuesday. You cannot swap Tuesday for a different day of the week, ever. Oh, come on, really? Unless you're in prison, chances are that you'll have occasions where you'll be dining out - or in - with other people. Social occasions. Business dinners. Family events. It might not be convenient - or polite - to bring out your plastic container of Super-Enzyme-Biofuel-Cabbage-and-Kidney-Bean-Goop and start slurping that down while trying to have a polite conversation with your boss or your mother-in-law. The smart chefs in the book are real chefs. They're around food every day. Good food. I figured that their advice would not be full of chemical-laden diet food that looks like hamster pellets and tastes like the box it was packaged in. And I figured they wouldn't ban entire food groups or suggest that stark denial is the only way to go. Because chefs have to eat as part of the job. A chef couldn't eliminate vast categories of food unless that also meant eliminating tasting the food as they cooked - or perhaps changing the menu to accommodate the diet. I'm not a chef. Not even close. But as a food writer, recipe creator, and food blogger, I cook a LOT of food. It's one thing when I'm following a recipe I know and I can simply throw things at a pot and know it will work. It's an entirely different thing when I'm working on a new recipe that needs to be tweaked and revised and redone multiple times and there's a lot of tasting going on. So I was curious if the chefs would have any tips that would make sense for me. I was immensely pleased when the first lesson was: "Smart chefs surround themselves with real food they love." Woah. It sounds dangerous, but Michael Psilakis then explained, "People don't realize you can eat a lot of good food - but you can't eat garbage food." But that doesn't mean junk food is banned, if it's something you actually love. It's more about not eating things simply because they're there, and not eating food that doesn't satisfy you. Rick Bayless says that he'd rather have one bite of something he loves than a whole meal of something mediocre. Lesson 2 is about not feeling guilty about food. Eric Ripert says that he has no guilty pleasures when it comes to food, because he doesn't feel guilty about anything he eats. He says there's nothing that you can't eat - but there are things you should eat less off. And it goes on from there, with simple tips that have worked for these people who work with food. Instead of a book that tells you to avoid foods, feel guilty, deprive yourself, and turn your dinner table into a science experiment, it's really all about welcoming good food into your life. It's about living a life surrounded by good food - and some of it very decadent - without driving yourself crazy. I'm not quite done with the book yet, but I wanted to get the thumbs-up on this one quickly. It was JUST released, so you can still be one of the first to get your hands on it. 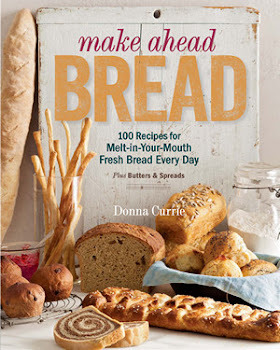 I'm looking forward to trying some of the recipes - and yes, there are even some desserts. Because of course, you're just going to eat a little bit, and not a lot, right? And I plan on reading this book twice. This first time, for an overview. And then a second time to really absorb what they're saying. Yes, I like it that much. I don't know if it's going to make me any healthier - but I think it will make me a little more thoughtful about my food choices. And that's good, right?